This entry was posted on July 8, 2008 at 7:00 am and is filed under baking, food, tuesdays with dorie with tags baking, baking: from my home to yours, beef, berries, black and decker, black and decker powerpro ii, black and decker powerpro ii food processor, blueberries, blueberry pie, blueberry pies, butter, costco, crust, dad, dan, dorie greenspan, double crust, double crusted blueberry pie, double pie crust, flour, food processor, grip-rite, ground beef, keebler, keebler elves, mom, pie, pie crust, pie plate, pies, powerpro ii, powerpro ii food processor, pyrex, pyrex grip-rite pie plate, pyrex pie plate, rage against the machine, salt, shortening, sugar, target, tuesdays with dorie, vegetable shortening, water. You can follow any responses to this entry through the RSS 2.0 feed. You can leave a response, or trackback from your own site. I have managed to avoid the nutrition information in this pie — then I get blindsided by it on YOUR site. Thanks a lot. don’t know if i ever mentioned this over on my site .. – but my senior quote in my high school’s yearbook was “I like pie.” – seriously.. I seem to remember that from one of your blogs. I should have overnighted you a slice of my awesome pie! Hilarious post, and it will so get easier with time. You have to give yourself a little time to ramp up. No one can bake masterpieces overnight. Unless, your last name is Keebler. And they so need to stop their whining. I’ll bet you made your mom’s day when you asked for help. 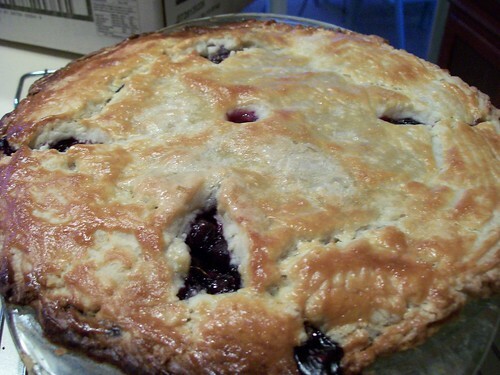 Your pie looks great for a first timer! Doesn’t matter that it’s ugly, what matters is how it TASTES. Good work! 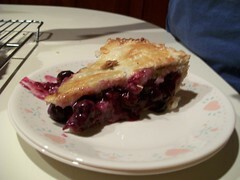 That sure looks like a tasty pie! Hang in there — baking does take practice. The good news is, most of the time your mistakes will still taste wonderful! Dorie’s recipe makes plenty of crust — I think you just needed to roll it a bit thinner and larger next time. I have pie plates ranging from 9 inch to 10 inch (and some little 6 and 7 inch ones too–could it be I have too many pie plates? Naaahhh.) and this recipe would work for all of them. OMG – dude I have those SAME exact plates (you’ll see them on occasion on my blog! LOL). I’m a huge Corningware plate fanatic since they’re *almost* indestructible – I say “almost” because when I was about 7 years old, I tried tried tried to get one to break… eventually dropping it as I was standing on the kitchen counter (yes, I did say *standing* on the kitchen counter). When it did break, it shattered into no less than three gazillion pieces. Yup, I got in biiiiiiiiig time trouble for that move 😉 Anyway, glad you enjoyed making the pie and that it tasted so wonderful. 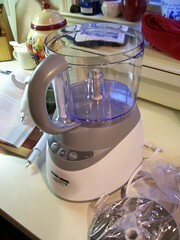 Your first food processor… yay you!! !